A groundskeeper at Suffolk County Community College in New York said he was told that wearing his "Make America Great Again" hat — the symbol of President Donald Trump's 2016 campaign — is verboten while he's working on campus. Salvatore Esposito — an Iraq War veteran who's worked the campus in Selden for 11 years — told News12 Long Island he wore his MAGA hat to work Sunday for the very first time, and then the following day was told to not wear it again while he's on the job. He added to the station that the school's executive dean sent his boss an email about it, which reads in part: "While that hat doesn't have a political candidate's name nor a party or logo on it, it has nevertheless reached the level of being a clear political statement. Please reinforce to staff that political attire is not permissible during working hours." Indeed, the iconic red cap has become a lightning rod for a growing number of those on the left who say it's synonymous with racism, bigotry, and hatred. Esposito told News12 he was surprised because it seemed the school always let staff promote progressive ideas and wear clothing with left-leaning messages. He added that he's seen staff members wearing "plenty of Hillary hats." "I feel that the college is biased against me because of my political beliefs," Esposito, a registered Republican, told Newsday. "They violated my First Amendment rights." 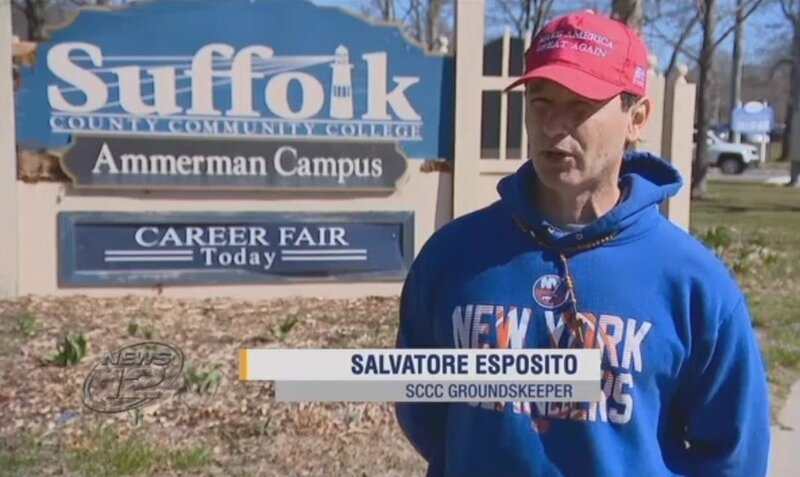 The SCCC administration now is indicating the dean misspoke, and that the issue isn't about Esposito wearing a MAGA hat, the station said — but that he was wearing a hat, period. But Esposito told Newsday he's worn hats on the job for years, from Yankees and Islander caps to one with the Army logo. "They were never concerned about me wearing a hat before," he said. The logical conclusion? Esposito told News12 he's sure the issue is about the MAGA hat and what it may represent to different people. And not all of them at SCCC are liberal Democrats, he told the station. "There are more Donald Trump supporters here than people realize," Esposito told News 12. "They're just afraid to come forward because they don't want to be stigmatized the way I was." The college told the station that no disciplinary action was taken against Esposito, and that it's working with union leadership to order uniform hats for the grounds crew.